Request to walk with me. Quotations that make sense to me. 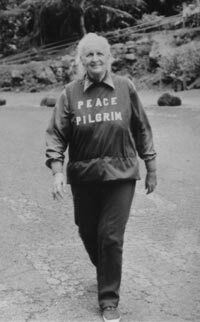 Peace Pilgrim (July 18, 1908 – July 7, 1981) born Mildred Lisette Norman, was an American pacifist, vegetarian, and peace activist. In 1952, she became the first woman to walk the entire length of the Appalachian Trail in one season. Starting on January 1, 1953, in Pasadena, California, she adopted the name “Peace Pilgrim” and walked across the United States for 28 years. A transcript of a 1964 conversation with Peace Pilgrim from a broadcast on KPFK radio in Los Angeles, California, was published as “Steps Toward Inner Peace“. She stopped counting miles in that year, having walked more than 40,000 km (25,000 mi) for peace. [poultry farm in Egg Harbor City, New Jersey, in 1908, the oldest of three children. Her mother, Josephine Marie Ranch, was a tailor, and her father, Ernest Norman, a carpenter. Although poor, the family were well-thought-of in a community of German immigrants, whose relatives originally settled the area after escaping Germany in 1855. In 1933 she eloped with Stanley Ryder and moved to Philadelphia in 1939. They divorced in 1946. Her pilgrimage spanned almost three decades beginning January 1, 1953, in Pasadena, California. The Korean War was in progress. She continued walking for 28 years, spanning the American involvement in the Vietnam War and beyond. Peace Pilgrim was a frequent speaker at churches, universities, and local and national radio and television. On July 7, 1981, while being driven to a speaking engagement near Knox, Indiana, Peace Pilgrim was killed in an automobile accident. At the time of her death, she was crossing the United States for the seventh time. After her death, she was cremated, and her ashes were interred in a family plot near Egg Harbor City, New Jersey. If you have read all about this lady, you will undoubtedly see why she deserves the title ‘Warrior Extraordinaire’. I have no idea just what her faith had dictated to her, but it is evident that she acted in harmony with her vow to challenge the things she saw as wrong with the world in her time. And she was unwavering in her dedication to the cause she believed needed fighting for. If only people were half as determined and focused as she, the world would already be at peace. It is with a huge smile on my face at her positivity, that I even attempt to emulate an ounce of her courage. The shoes of people I am unfit to tie have set the president here and I humbly set out in their shadows with my project, to try to bring the nation to the table of discussion towards peace, tolerance and harmony. Peace Pilgrim will never be forgotten, least not by me, her image as a warrior for peace shines as brightly as the sun.